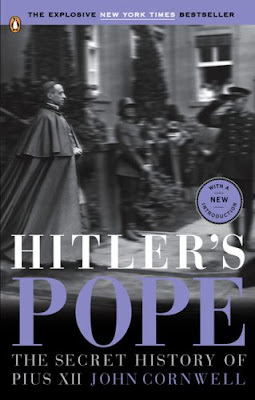 One website offering the e-book of Cornwell's "Hitler's Pope" carries this picture: The English edition of the book has this rather clearer version which demonstrates how the above one has been altered. At least this one shows that the chap wearing the peaked cap is obviously the driver; nevertheless, the juxtaposition of the title is says it all. 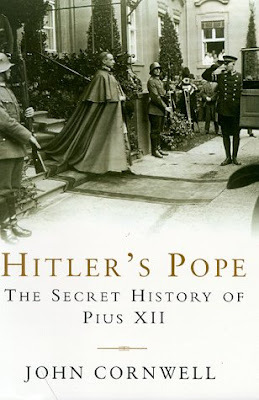 Originally, the picture was referred to on the dust-jacket as being from 1939, "Cardinal Pacelli, the future Pope Pius XII, leaving the presidential palace in Berlin." It is actually from 1927. Archbishop Pacelli, then papal nuncio to Bavaria, had been to a birthday reception for Hindenberg, the President of the Weimar Republic. (Hitler did not become chancellor for another six years.) The soldiers in the picture are soldiers of the Weimar Republic. They are not the SS. 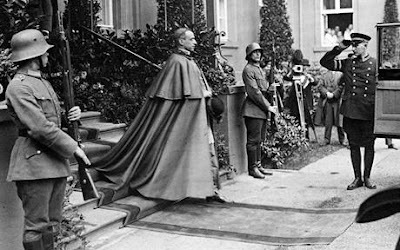 "Pope Pius XII leaves the presidential palace in Berlin in 1927. The controversial former pontiff was moved a step closer to sainthood on Saturday"
They managed to get the date right but I wonder how many Indie readers know without looking up google, that Archbishop Pacelli was not made a cardinal until 1929, and was not elected Pope until 1939. The picture is used, as ever, to give a sombre hint, in vintage black and white, of Pope Pius XII consorting with the Nazis. While we are on the subject of Pope Pius XII, you might like to have a look at a post from January 2007: "KGB plotted to discredit Pius XII" and the links given there. Basically, Ion Mihai Pacepa, a high-ranking intelligence official in Roumania who defected to the West, tells National Review Online how the KGB organised the play "The Deputy" in order to discredit the Church. Father Gumpel, relator of the cause for beatification of Pius XII, urged prudence over some aspects of the revelations of Pacepa but was in agreement over "The Deputy" being a tool of Soviet propaganda. In countries under Soviet occupation, the showing of the film was obligatory at least once a year in major cities.